It's difficult not to pass any neighborhood flower shop or overlook the multitude of Pinterest boards showcasing the adorably trendy succulent plant. I get it... They're small, extremely easy to maintain and crafty terrariums have just about replaced all mini zen gardens. These water saving plants (did you know cacti are succulents!) are so popular right now, I had to scour four different plant shops to find some to model these cupcakes after. 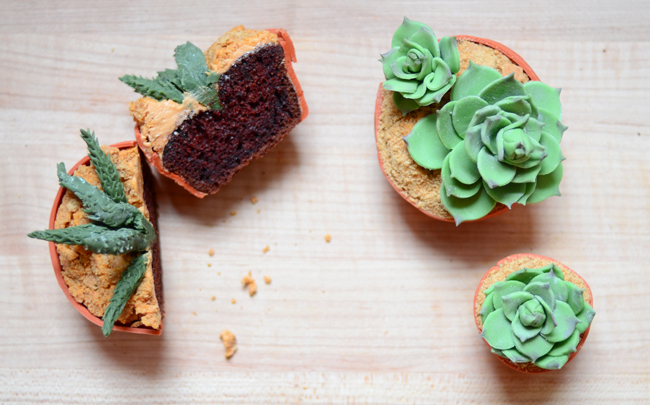 The cupcakes might get eaten, but the plants are here to stay. Say hello to spring and swap these cupcakes for a cake at your next event. I also kept things simple with frosting. 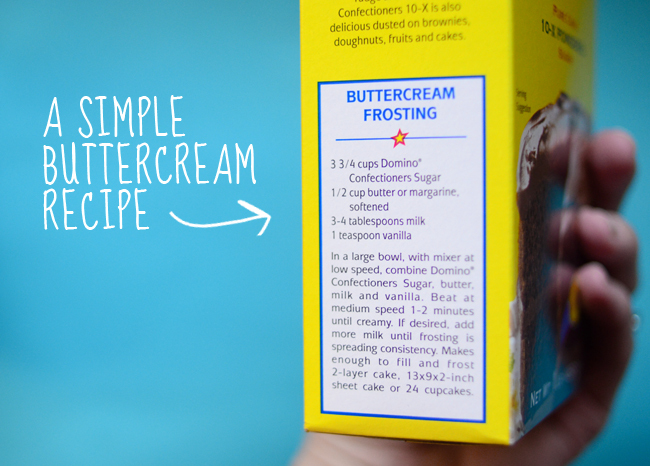 Domino Sugar has the simplest buttercream recipe around. 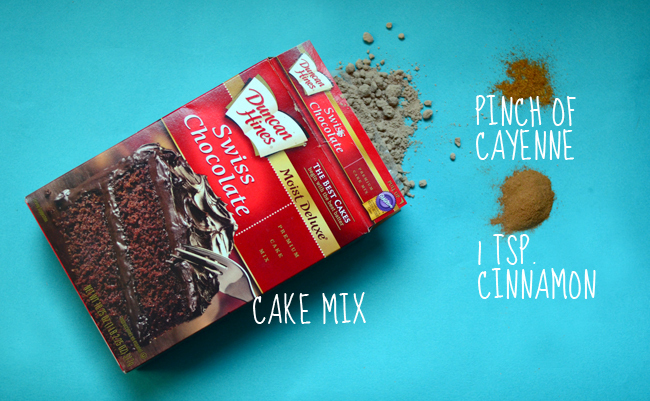 It's pretty sweet, but this buttercream is the perfect base for the "dirt." I dyed the buttercream to match the graham cracker crumbs, but then I realized the color resembled a peanut butter frosting. Next time, Ill skip the food coloring and just use peanut butter in my frosting. 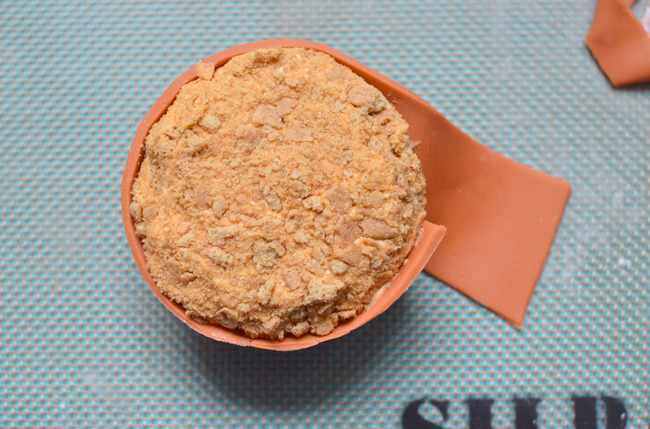 Is there anything graham cracker crumbs can't solve!? 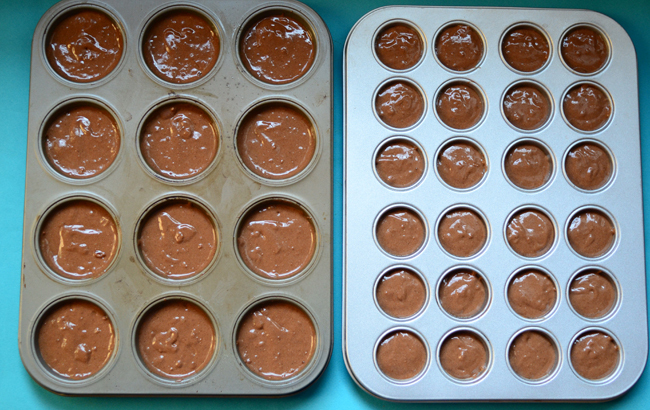 Once you've frosted and covered your cupcakes with "dirt" you're ready to work with the fondant. 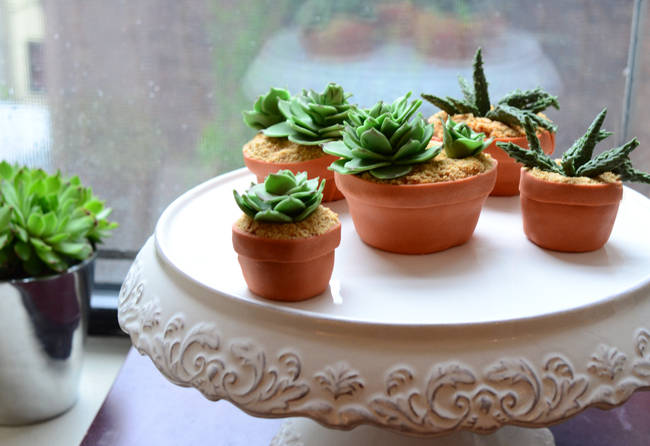 Use gel food coloring (also available at craft stores) to match the terra-cotta and the succulent green leaves. For the terra-cotta, you'll need a few drops of orange and brown. For the succulent green, use a few drops of electric green and a small drop of black. 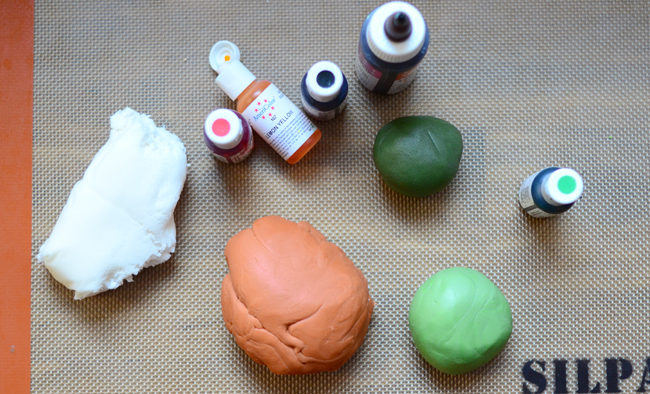 Knead the color into the fondant until you have the right shade. It helps to have a real succulent plant nearby to compare it to. Dust your work surface with a little confectioners sugar to prevent the fondant from sticking and roll the fondant out to make your terra-cotta pot. Use buttercream to stick the fondant to the cake. Remember to wrap any unused fondant immediately or it will dry out. Build your succulent from the inside out. Use a dab of water to stick the leaves to each other. 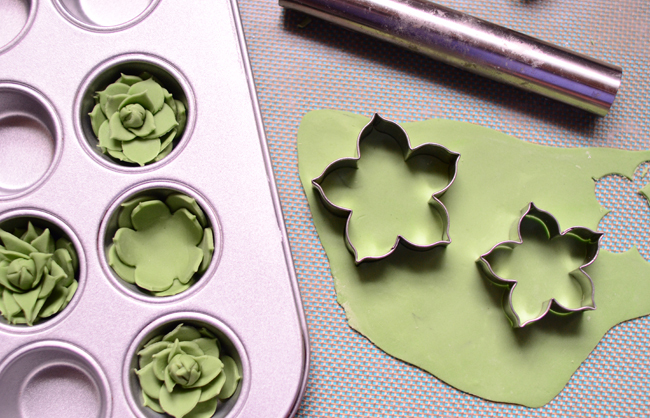 Roll out the green fondant to 1/8-inch thick to make the succulent leaves. I've found that Petunia cutters work best to mimic the succulent shape. Look for 3 cutters, ranging in size from 1 1/2 to 2 3/4. 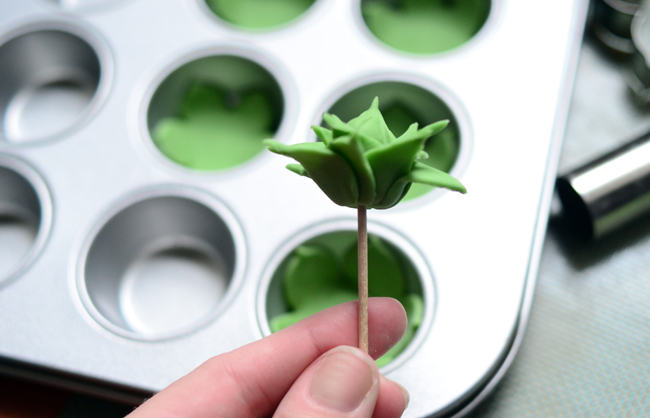 Mini muffin tins help to mold the leaves. They will harden as they sit, then you can nest the smaller leaves into the larger ones, using a dab of water or buttercream as glue. I had purple edible petal dust to highlight the tips of the succulent leaves, but you could easily use cocoa powder instead. I used powdered sugar to add the "frosted" effect. Can you tell which one is the plant and which one's the cupcake? I love how it's so detailed! WOW! these are absolutely stunning! i can only imagine the time and patience it would take to create such perfect leaves! love, love it! These are fantastic! They look so real, I just love them! Thanks for posting a plant that's just not "another flower"
Little works of art! Love this! are you serious? this is INCREDIBLE! Wow. Those are absolutely amazing! These are the best looking cupcakes I have seen in a while. Has anyone tried to make them? They seem like they would take a bit of time to make. I made them today. Turned out really well. Took me about 3 hours to make a dozen.totally worth it! My green thumbed friend is going to love them! Could I ask where you found that cookie cutter? I haven't seen one in that shape before and it works so perfectly for the leaves on the succulents! PS I am obsessed with these cupcakes! I will be making them the moment that I have the time. :) Excellent, beautiful work. I really love the succulents and thank-you for sharing the process to make them! I'm thinking of doing thee for our wedding cupcakes and on the cake..I don't suppose you would be able to share what brand azalea cutter you have? I have been scouring google but none look quite like yours! I can't remember where I got mine, but this company sells them..Just scroll down to see the Azalea cutters. Thanks! FYI - my cake supply calls it a petunia cutter. I am obsessed with these! So clever. These are genius. Love them! These are great! I have been wanting to know how to make a succulent. I can't wait to try it. Hey, this was My idea. LOL. I waited too long....love your stuff! WOW! These are amazing! And I bet they taste delicious too! These are STUNNING. I have to try them out one day. My mother loves these little plants. I feel a birthday adventure in baking coming on! Hello! I don't know how much you like to share, but how did you manage to get that excellent succulent green? I use americolor gel paste (exactly what you have in the picture above) and I can't seem to get it right! Hi! I always add lots of yellow to make more of a "leaf green" color. For the succulents, I also added a couple drops of black to dull the green. Hopefully that works. The best thing to do is add a little bit of color at a time, matching it to the actual plant in front of you. Good luck! Thanks! I just wasn't sure if it was some wacky combo - like how you mix violet and yellow to get moss green (?!?). When I added yellow, it turned too much of a lime color - almost florescent! I'll try a bit of black - hopefully that will do the trick! Thanks so much! Brilliant! What completely delightful, clever cupcakes! I can't wait for an excuse to make some of my own. Thank you for sharing this tutorial! They look amazing! Just saw you on "The Chew". You are my new hero... loved the cupcakes! Just saw you on "The Chew", and WOW. 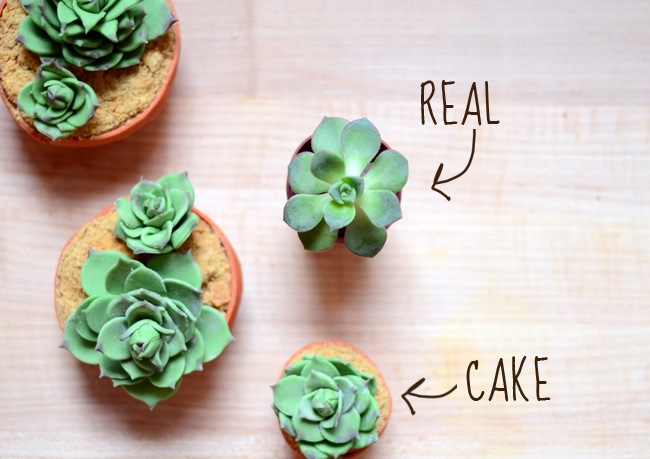 Those cupcakes, aka, succulents, we're amazing. ok call me dum but what is fondant? I just saw you on the CHEW so impressed had to look you up! WOW!!!! Saw you on The Chew and you are so creative and inventive! Love the blog, love your ingredient images and designs. Totally fun and inspiring, I can't wait to read more and scour your blog and Pinterest for fun ideas and inspiration. Thank you! Amazing... they look so real! brilliant job! i am in love with these! so happy to have just found your blog! This is an absolutely brilliant idea-- beautiful! I LIKE THESE VERY BEAUTIFUL CAKES BECAUSE THESE CAKES ARE LOOK LIKE AS AGAVE PLANTS. A perfect tutorial! Thank you SO much! Adorable! This technique could also be applied to polymer clay. Thank you, I have featured this on my Pinterest Board. Thanks for sharing this great tutorial with us! Wow, it´s really amazing .. These are beautiful! 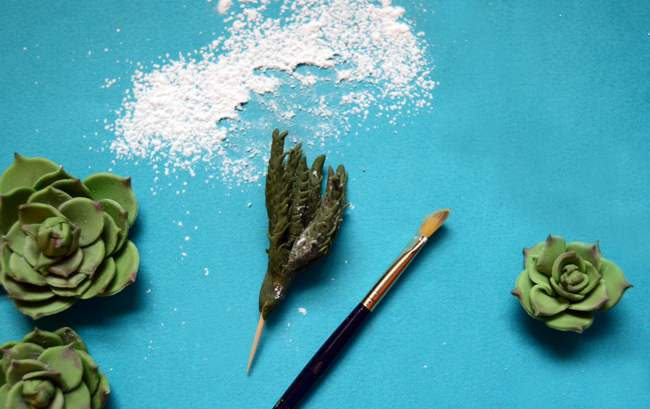 What specific green colour/dye did you use for the succulent made out of the Azalea cutter? Thanks! These are beautiful! 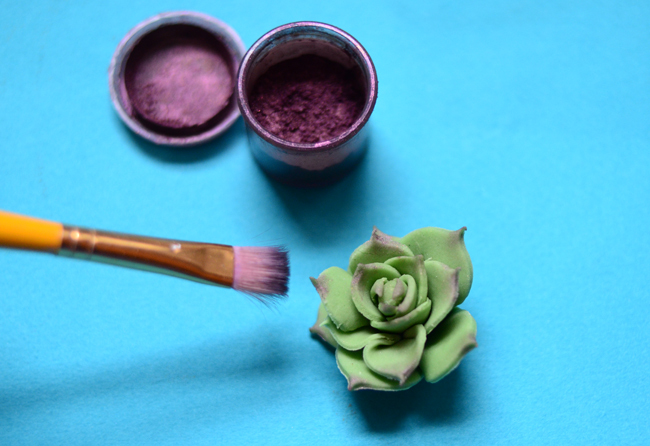 What specific brand & colour did you use for the succulents made out of the Azalea cutter? Thank you! Seton: My fiancee and I are planning to do this as cupcake toppers for our wedding. I'm hoping you can help answer a few of our questions. 1. Can we start with green fondant and use gel coloring to change it to the right shade? 2. 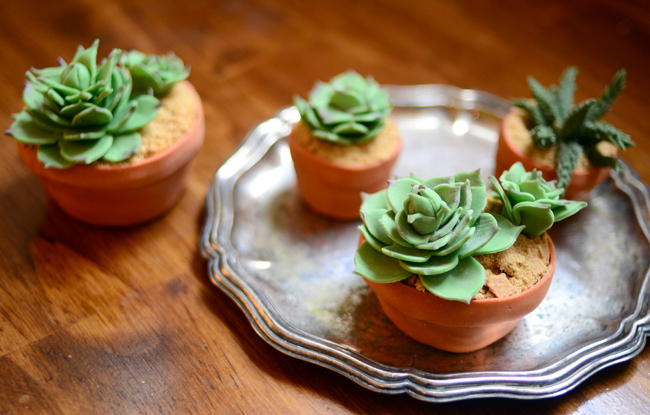 How long can we store these succulent fondants to still be edible? we were of using choco-pan or pettinice fondant. we are thinking of making them ahead of time and storing it in the fridge. 1. Yes, you can use green as a base color. You might have to add a touch of black gel coloring to dull the bright green color. And if its too dark, add some white fondant. 2. Making them in advance is a great idea. Fondant has a very long shelf life but you don't want to put them in the fridge (the condensation will make them sticky). Keep them in an airtight container away from direct light, heat and moisture. They will get harder as they age, so if you really want them to be eaten, I wouldn't make them more than a week in advance. Hope this helps! I simply love these! The detail work is beyond belief and having tried using Fondant myself I know how difficult it can be. I just thought you might enjoy know a little "tid bit" about the plant you featured. My mother and actually everyone I know in my home town called these plants HENS & CHICKENS which I think is just perfect. The smaller plants try to keep up with the larger! Just discovered you today and will be coming back often. Love! 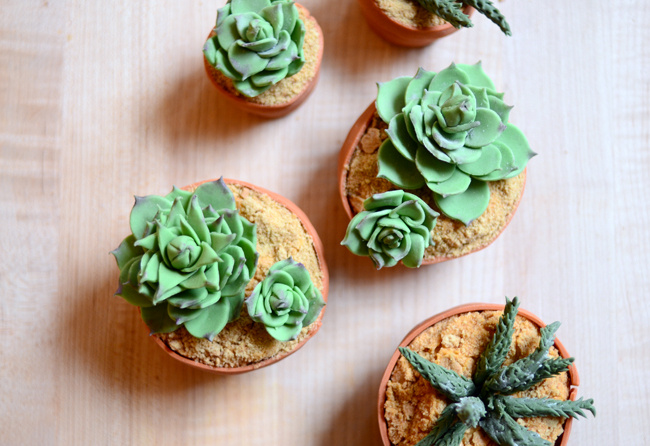 I am planning on making these for my sister in law for her birthday as she adores succulents! Cannot seem to find a purple dust as dark as yours, what brand is this one? these are stunning! Where can I purchase the purple petal dust? But you can find it online or at most baking stores. Thanks! Hi! 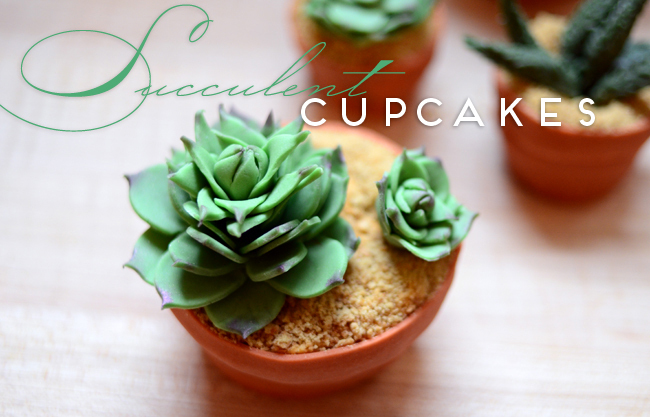 Did you use toothpicks to secure the succulents on top of the cupcakes? If so, how did you insert the toothpicks without cracking/breaking the fondant? Thanks! Hi! 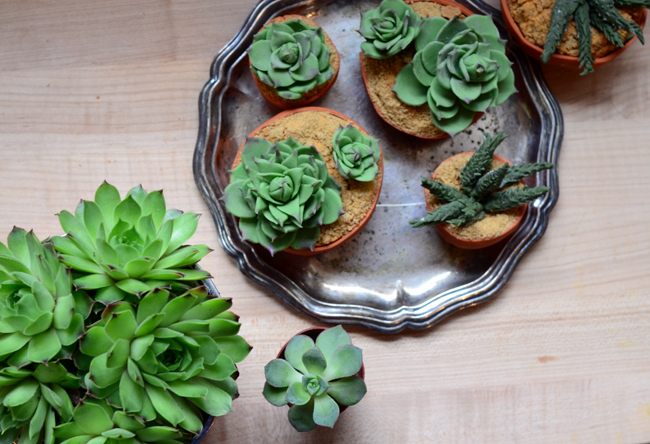 You can carefully insert the toothpicks before the succulents are fully dry. OR, you might find that you don't even need the toothpicks if you use enough frosting to secure the succulent to the cupcake. Hope that helps! Hi Seton, I am so glad to found your tutorial of succulents. You've done a wonderful job with the fondant. I'm making modeling chocolate succulents...and I'm going to post about you tutorial. I wanted to use one of you pictures but I wasn't able to contact you other than on the comments here. My blog is Chocolate Mondays and web address is www.michelescafe.blogspot.com. Thank you again for your tutorial. What cutter did you use for the center of the succulent, that little tear looking like one? Hi Soonmi! It's a rose petal cutter. The smallest one I had that was part of a larger set. Thanks!